A router[a] is a networking device that forwards data packets between computer networks. Routers perform the traffic directing functions on the Internet. Data sent through the internet, such as a web page or email, is in the form of data packets. A packet is typically forwarded from one router to another router through the networks that constitute an internetwork like the Internet until it reaches its destination node. A router is connected to two or more data lines from different networks. [b] When a data packet comes in on one of the lines, the router reads the network address information in the packet to determine the ultimate destination. Then, using information in its routing table or routing policy, it directs the packet to the next network on its journey. Distribution routers aggregate traffic from multiple access routers. Distribution routers are often responsible for enforcing quality of service across a wide area network (WAN), so they may have considerable memory installed, multiple WAN interface connections, and substantial onboard data processing routines. They may also provide connectivity to groups of file servers or other external networks. External networks must be carefully considered as part of the overall security strategy of the local network. A router may include a firewall, VPN handling, and other security functions, or these may be handled by separate devices. Routers also commonly perform network address translation which restricts connections initiated from external connections but is not recognised as a security feature by all experts.. Some experts argue that open source routers are more secure and reliable than closed source routers because open source routers allow mistakes to be quickly found and corrected. Routers are also often distinguished on the basis of the network in which they operate. A router in a local area network (LAN) of a single organisation is called an interior router. A router that is operated in the Internet backbone is described as exterior router. While a router that connects a LAN with the Internet or a wide area network (WAN) is called a border router, or gateway router. ^ Router is pronounced /ˈruːtər/ in British English and is typically pronounced /ˈraʊtər/ in American and Australian English. ^ This particular idea had been previously pioneered in the CYCLADES network. ^ The forwarding action can be collected into the statistical data, if so configured. ^ A router can serve as a DHCP client or as a DHCP server. ^ "Overview Of Key Routing Protocol Concepts: Architectures, Protocol Types, Algorithms and Metrics". Tcpipguide.com. Archived from the original on 20 December 2010. Retrieved 15 January 2011. ^ "Cisco Networking Academy's Introduction to Routing Dynamically". Cisco. Archived from the original on October 27, 2015. Retrieved August 1, 2015. ^ H. Khosravi & T. Anderson (November 2003). Requirements for Separation of IP Control and Forwarding. doi:10.17487/RFC3654. RFC 3654. ^ "Setting uo Netflow on Cisco Routers". MY-Technet.com date unknown. Archived from the original on 14 July 2011. Retrieved 15 January 2011. ^ a b "Windows Home Server: Router Setup". Microsoft Technet 14 Aug 2010. Archived from the original on 22 December 2010. Retrieved 15 January 2011. ^ Oppenheimer, Pr (2004). Top-Down Network Design. Indianapolis: Cisco Press. ISBN 978-1-58705-152-4. ^ "Windows Small Business Server 2008: Router Setup". Microsoft Technet Nov 2010. Archived from the original on 30 December 2010. Retrieved 15 January 2011. ^ "Core Network Planning". Microsoft Technet May 28, 2009. Archived from the original on 2 October 2010. Retrieved 15 January 2011. ^ "Security Considerations Of NAT" (PDF). University of Michigan. Archived from the original (PDF) on October 18, 2014. ^ "Global Internet Experts Reveal Plan for More Secure, Reliable Wi-Fi Routers - and Internet". Archived from the original on 2015-10-20. ^ Tamara Dean (2009). Network+ Guide to Networks. Cengage Learning. p. 272. ISBN 9781423902454. ^ "M160 Internet Backbone Router" (PDF). Juniper Networks Date unknown. Archived (PDF) from the original on 20 September 2011. Retrieved 15 January 2011. ^ "Virtual Backbone Routers" (PDF). IronBridge Networks, Inc. September, 2000. Archived (PDF) from the original on 16 July 2011. Retrieved 15 January 2011. ^ Roberts, Dr. Lawrence G. (May 1995). "The ARPANET & Computer Networks". Archived from the original on 24 March 2016. Retrieved 13 April 2016. 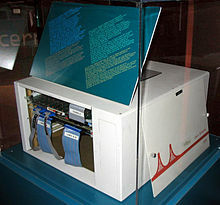 Then in June 1966, Davies wrote a second internal paper, "Proposal for a Digital Communication Network" In which he coined the word packet,- a small sub part of the message the user wants to send, and also introduced the concept of an "Interface computer" to sit between the user equipment and the packet network. ^ Davies, Shanks, Heart, Barker, Despres, Detwiler and Riml, "Report of Subgroup 1 on Communication System", INWG Note No. 1. ^ Vinton Cerf, Robert Kahn, "A Protocol for Packet Network Intercommunication", IEEE Transactions on Communications, Volume 22, Issue 5, May 1974, pp. 637 - 648. ^ David Boggs, John Shoch, Edward Taft, Robert Metcalfe, "Pup: An Internetwork Architecture" Archived 2008-09-11 at the Wayback Machine, IEEE Transactions on Communications, Volume 28, Issue 4, April 1980, pp. 612- 624. ^ "Ms. Ginny Strazisar". IT History Society. Archived from the original on 1 December 2017. Retrieved 21 November 2017. ^ Craig Partridge, S. Blumenthal, "Data networking at BBN"; IEEE Annals of the History of Computing, Volume 28, Issue 1; January–March 2006. ^ Valley of the Nerds: Who Really Invented the Multiprotocol Router, and Why Should We Care? Archived 2016-03-03 at the Wayback Machine, Public Broadcasting Service, Accessed August 11, 2007. ^ Router Man Archived 2013-06-05 at the Wayback Machine, NetworkWorld, Accessed June 22, 2007. ^ David D. Clark, "M.I.T. Campus Network Implementation", CCNG-2, Campus Computer Network Group, M.I.T., Cambridge, 1982; pp. 26. ^ Pete Carey, "A Start-Up's True Tale: Often-told story of Cisco's launch leaves out the drama, intrigue", San Jose Mercury News, December 1, 2001. ^ Roberts, Lawrence (22 July 2003). "The Next Generation of IP - Flow Routing". Archived from the original on 4 April 2015. Retrieved 22 February 2015. ^ David Davis (April 19, 2007). "Cisco administration 101: What you need to know about default routes". Archived from the original on December 19, 2017. ^ Diane Teare (March 2013). Implementing Cisco IP Routing (ROUTE): Foundation Learning Guide. Cisco Press. pp. 330–334. ^ Diane Teare (March 2013). "Chapter 5: Implementing Path Control". Implementing Cisco IP Routing (ROUTE): Foundation Learning Guide. Cisco Press. pp. 330–334.